Harry Potter actress Emma Watson has revealed that she found it much more awkward to kiss Rupert Grint, than she did kissing Daniel Radcliffe. The three youngsters have grown up together since the first Harry Potter movie and Emma admitted that she sees them like brothers. Watson explained, "I just had to remind myself I am an actress, I am Hermione, this is a role but it was really hard. We just have so much history together. They are like my brothers. Dan and I could sort of have a laugh about it. Whereas Rupert's a bit more quiet so I didn't really know what he was thinking, which made me a bit more nervous. So kissing Rupert was probably weirder actually. Dan wasn't so bad." She also revealed that she was looking forward to the freedom of no longer having to play Hermione Grainger, after ten years. "The amount of holidays I've had to sit in the shade or when I've gone skiing, not being allowed to ski. Or just not being allowed to get my ears pierced or paint my nails. Silly things like that, that you wouldn't really think about, but obviously being Hermione I wasn't allowed to do," said Emma. 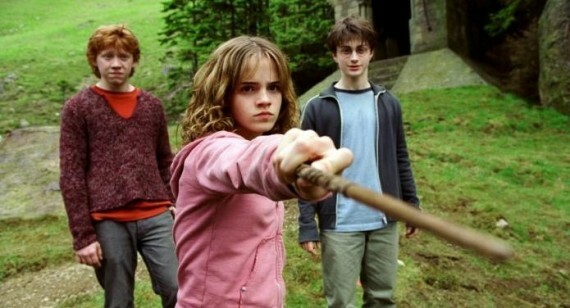 Harry Potter and the Deathly Hallows: Part 2 will be released on July 15. Are we going to see Emma Watson, Daniel Radcliffe, and Rupert Grint return for Harry Potter and the Cursed Child trilogy?